Come on in, take a peek, and enjoy the tour! Beginning with a private driveway, and a circular bubbling fountain, this modern farmhouse sits on six acres overlooking the 16th hole of a Jack Nicklaus Signature Golf Course. 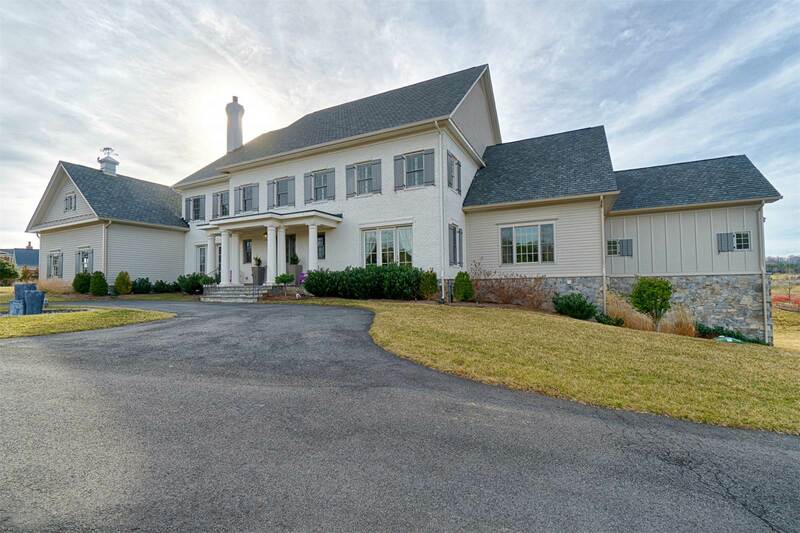 A beautiful farmhouse door greets you as you enter into this incredible estate home. The foyer is light and bright. A birdcage chandelier hangs gracefully in the foyer..(I Love this chandelier..I have the same one in my home). The home has wide plank white oak floors throughout the open living areas, library, solarium, office and first floor master bedroom. I am floored by these floors! (No pun intended) They are amazing and look incredible. The light color truly exemplifies the modern farmhouse style. The neutral colors of the home are beautifully done and cohesive with the open floor plan. The gourmet kitchen is to die for, with high-end appliances, marble counter-tops and light colored inset cabinets. The farmhouse pendants add the perfect touch to this grand kitchen. The cozy dining room has modern built in shelves with lighting. The slip covered dining chairs look terrific and so comfortable next to the grand fireplace. The main level of the home features a double sided fireplace and opens up to the exterior through beautiful french doors. An arial view of the space showcases all the extra details of the home such as moldings and extensive trim. Large double pocket doors lead into the office space. The kitchen has a separate cozy eat in area next to the double sided fireplace. One of the things I love about this house is the neutral decor, the floors, furniture and paint are neutral. You can shop the look at the bottom of the post. This view of the kitchen shows how grand the island is with farmhouse style pendants, and the kitchen is perfect for entertaining. The sunroom is surrounded by windows and has a magnificent view of the golf course. Leading out on the private covered patio, there is a wood burning fireplace, perfect for hanging out with family and friends. I love a good mudroom and this one is fabulous! The herringbone floors and inset cabinets are great and provide ample space, perfect for a large family. Loving the tray ceiling with cove lighting in the master bedroom, so intimate and elegant. The sitting area of the master bedroom is enormous and very private. The master bath is so luxurious and inviting. Check out the spa like shower and tub! I would never leave this home. The guest bedroom is very comfortable and spacious, and private with plantation shutters. The guest bathroom is welcoming indeed! The beadboard wall paneling is right up my alley! Love it! Cool design in the shower, haven’t seen anything like this before! The hammered copper sink is stunning. Love the 2 different tile layouts in the shower, vertical thin long tiles on one wall and horizontal large tiles on the other wall. Bed situated to take advantage of the incredible views. Marble double vanity and farmhouse style cabinets with modern hardware. Love it all! Heading down to the basement, my favorite area of a home. This home has a large bar, and a spacious seating area. The industrial style bar stools fit perfectly in this home. Behind the bar, the home has an ice maker and full size refrigerator. The flooring is immaculate and fits superbly well with the rest of the home. The wall paneling on the face of the bar and behind the bar provide the perfect styling for a modern farmhouse. Private room to play pool, I like it. Incredible indoor pool!!! Grab your swimsuit and take a dip anytime of the year in this indoor pool! Seriously…I’m never leaving! I’ll take 2 please! I believe this is the basement bedroom, big enough for 2 queen size beds. We come to another cool and unique bathroom design, love them all! Phew! What an amazing home. I Hope you enjoyed the haute home tour, thanks for stopping by. Interested in shopping the look check out these gorgeous pieces. This house is so beautiful!! Thank you for liking one of my blog posts! Hope you’ll stop by again. Is there a link for the floorplans? Beautiful! Hi Tia, no sorry I don’t have the floorplan. I would love to see the floor plan of this home. No sorry, I don’t have that information. how can i find out what some of her paint colors are?? Sorry, I don’t have that information. But if you’re looking for modern farmhouse paint colors, check out my Pintrest page and look under Color palette for ideas. Any chance you know the brand and color/name of the stone on the fireplace? No, I’m sorry I do not have that level of detail on the home.